The Trio Voronezh is a musical ensemble that produces incredibly exciting sounds and compelling arrangements of classics across a variety of musical styles, all played upon Russian folk instruments. This group includes Vladimir Volokhin on domra, Valery Petrukhin on double-bass balalaika, and Sergey Teleshev on bayan. The Trio includes the works of Vivaldi, Bach, Tchaikovsky, Stravinsky, Shostakovich, and Rachmaninov, as well as Russian folk songs, Argentine tangos, gypsy dance music, bluegrass and popular songs by Gershwin. 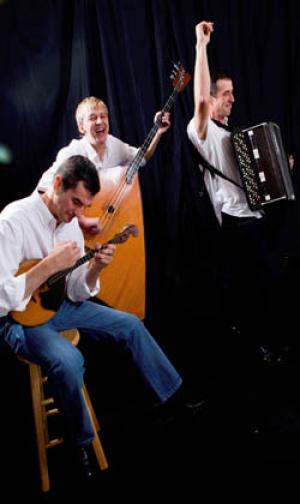 At the second part of concert the Flying Balalaika Brothers features vocalist Zhenya Rock on balalaika, accordion, guitar, and banjo; Sergey Vashchenko on balalaika, bass, accordion. They will play original music by composer Zhenya Rock. The City of Austin’s Cultural Arts Division, a grant from the Texas Commission on the Arts, and an award from the National Endowment all have helped make this event possible. Join us! Scottish Rite Theater 207 W 18th St.